Anthony Paine claims that no two guitars he builds as luthier of Harvester Guitars are exactly alike. 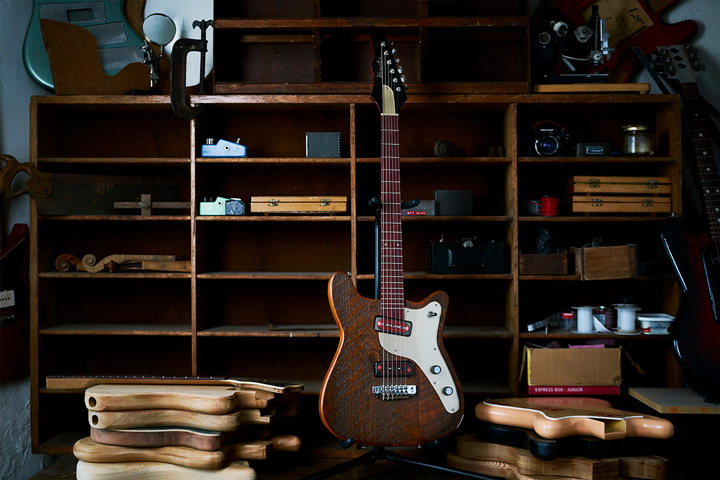 From his shop in Melbourne, Paine designs and constructs instruments with lush coloring, neo-space age contours, and the occasional unconventional material, working in the tradition of iconoclast builders like Travis Bean and Wandrè. 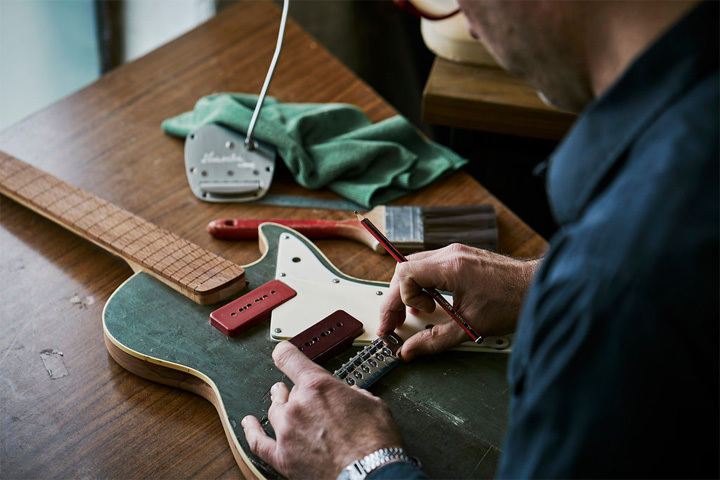 The gorgeous guitars in his Reverb shop are at once reminiscent of stranger Italian and Japanese designs from the 1960s and ahead of our own time. 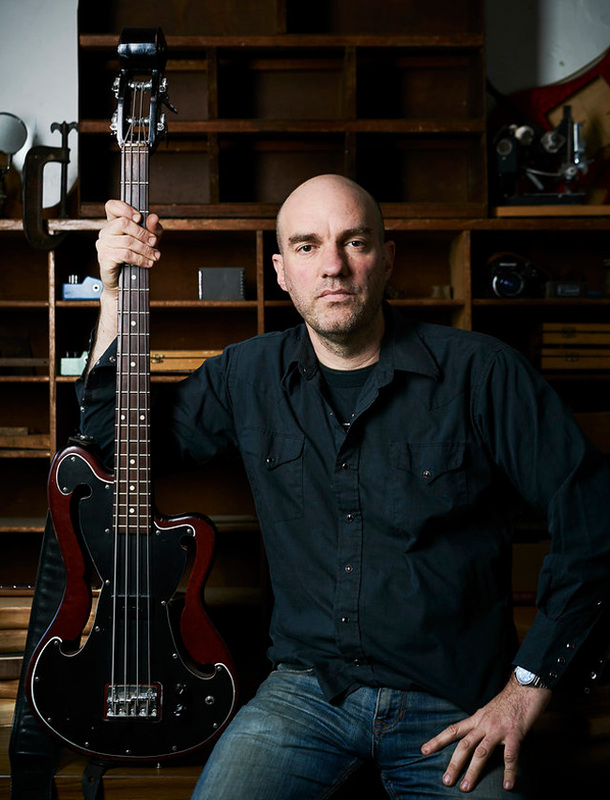 While corresponding over email for this interview, Paine laments a contemporary “square–eye,” referring to tastes in guitars that let manufacturers turn out the same old designs that have been popular forever. Paine’s eye is anything but square. The man behind Harvester guitars seems just as excited by the aesthetic possibilities of the guitar as the sonic ones. Can you tell me about what made you start Harvester Guitars? Harvester Guitars is just me really, exploring designs, feels, and sounds in my favorite medium: the electric guitar. I started out with a history in art and design as well as touring in scuzzy vans as a bass player. My love for vintage instruments and vintage machinery and industrial design in general have led me to this unique little corner of lutherie. How did you get into lutherie in the first place? The books would teach you traditional stuff like how to build an acoustic guitar with hand tools, how to carve a neck and how to repair vintage instruments. This, along with exposure to some early websites—like the great repairman Frank Ford’s 1990s website—helped to demystify the [guitar building] process for me. I had grown up with my father’s woodwork shop in the garage, as he’s a furniture guy, so I knew a lot about how wood behaves and responds to glue, fasteners, tension, finish, etc. Were there any luthiers that were important to you when you were starting out? I had read about Tony Zemaitis and was lucky enough to (gently) play some of his guitars in shops, back in the days when Tony was still building and the guitars were still traded openly in vintage shops. Here was a guy doing things his own way and putting instruments straight into the hands of the best players around. I loved similar stories about guys like John Veleno sneaking backstage at gigs to show his guitars to Marc Bolan and the Allmans. While I love the early guitars from the big factories, it was the unique stuff out of the little workshops that really inspired me. I soon had a Travis Bean, an SD Curlee, and some crazy sparkly Italian things from the pawnbrokers of Melbourne. 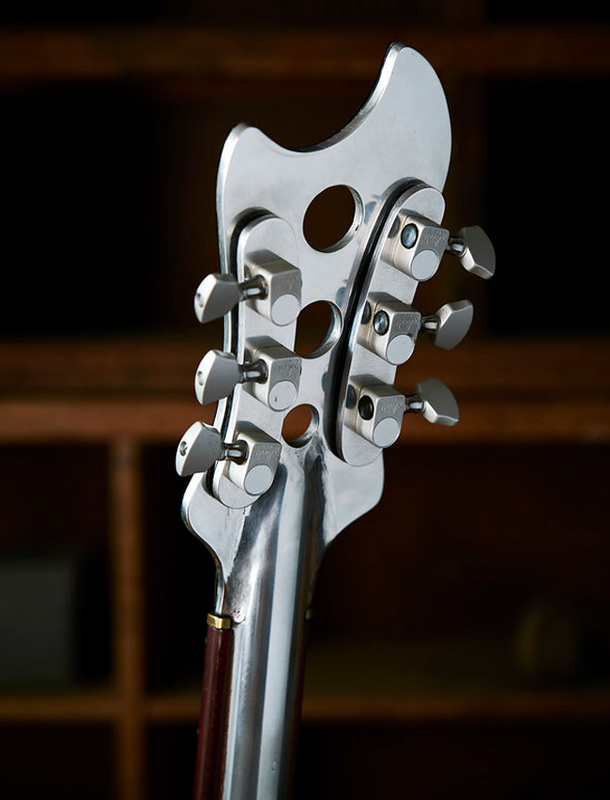 From there I learned a lot about the outer limits of the guitar world where form can follow function or bizarre forms can exist totally outside of the mechanical, geometric design of the instrument, as in the guitars of Antonio “Wandrè” Pioli. How have those old designs helped set your guitars apart from everything else out there today? The 21st century's cavalcade of guitar shaped objects that streams before our square-eyes can dull the senses and lead to some kind of electric guitar ennui. I think a lot of my work and the enthusiasm that I get back from my customers is born out of this restlessness. It led me to fabricate my own parts and methods and push my designs around until they make something new. The result still has to perform and feel right. I spend a lot of time playing my instruments as I set them up and prepare to ship them out the door. Bug Guitars from Melbourne, Australia was a local maker whose exquisite Danelectro–influenced work began and ended shortly before the dawn of the internet. His guitars were displayed and sold at exhibition in galleries. Travis Bean and P.A. Bigsby, too. I’m also influenced by 20th century industrial designers like Dieter Rams, Alec Issigonis, and Raymond Loewy. My own favorite gigging and recording instruments include my Kay Speed Demon bass and my Guild “Kickstand” Polara. Girl Brand Guitars from Tucson is [another] one. I was fortunate enough to get a guided tour of Chris Larsen’s adobe garage workshop one thanksgiving. His work showed incredible creativity and a knack for repurposing machinery and materials. Are there any other manufacturers that excite you these days? Specimen Products in Chicago has amazing designs and skills. Michael Spalt is always pushing the envelope with materials and presenting a gallery of inspired designs. Are there any noteworthy Harvester owners out there? I have some very inspiring names on my blackboard at the shop for this year but they’re paying customers who most likely don’t expect to see their names used by me, at least not until they have a shiny, new guitar to show for it. Building custom guitars for Jeff Tweedy of Wilco and Pete Holmström of the Dandy Warhols were definitely highlights of the last few years. Both [are] players with discerning gearhead reputations and sweet dispositions! Is there anyone you dream about building a guitar for? As far as dream customer wish lists, the possibilities are mindless. But for today I’ll just stick to guys named Mike: that’s Watt and Campbell. What does the future hold for Harvester? A bigger workshop with more clamps, an eight day week, and new band with no pedals. Well maybe one pedal each. I have lots of design ideas waiting to take shape, many of them veering towards the simpler end of the spectrum. I’m nurturing an obsession with the brutal simplicity of Japanese artwork and architecture. I’m sure that’ll seep into the designs somewhere. Ultimately I want to make more instruments per year and keep on exploring. Even if most of the explorations are purely technical, procedural, and hidden, they all add up.